People always ask me where I get my ideas for stories, so this month I’m expounding on some of the inspiration behind my novel No Place Like Motorhome. Most of my story ideas come from real life in some way or another, whether my own, or a friends’ or even someone I read about in a news article. 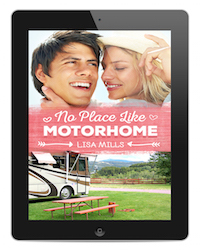 One of the plot lines in No Place Like Motorhome deals with expectations. Your spouse, your children, your parents, your friends, your coworkers and boss—everyone has expectations of you or for you. Sometimes those expectations can be a healthy motivating factor, but sometimes they can feel like a millstone around your neck. I’ve found that when one person is imposing their wants and needs, maybe even their fears, on another person in the form of expectations, things can get dicey, especially if the “expector” cannot see that the expectations are not in the best interests of the person they are imposing them on. As you get older it takes maturity and wisdom to sort through the expectations and set some boundaries so that all parties are satisfied with the outcome. But sometimes a compromise doesn’t seem possible. In No Place Like Motorhome, the relationship between Marc and his father is strained. Marc’s dad is a mechanic and runs a small garage in the town where Marc grew up. His dad wanted his boys to grow up and be mechanics and work with him in the shop, someday taking over the family business. While Marc learned enough from his father to be a fair mechanic, he has no desire to spend his life tinkering with the inner workings of cars and trucks and staring at the same four walls day after day. Marc is an explorer and adventurer who wants to travel and write about what he sees and learns along the way. The expectations have driven a wedge between him and his father until they almost never speak, and when they do, the conversations are strained and always seem to circle around to the expectations that Marc has failed to fulfill. Marc never understood why his father couldn’t seem to support his desire to be a travel writer until after his father had passed away. Not settling their differences and coming to terms with one another left Marc with a lot of regrets. How many relationships have been strained or broken because one person had unyielding expectations and the other person just wanted to be loved and accepted for who they were? It’s a heartbreaking tale that plays out over and over again each day on this earth. If only mankind would followed the example of Christ. “While we were yet sinners, Christ died for us.” He came to this earth and gave His life with the hope, not the expectation, that we would accept His gift of redemption. He knew we were imperfect and flawed, and that we may reject Him, but he loved us for who we were, right where we were. And He continues to offer His unconditional love—no demands, no expectations, no conditions.